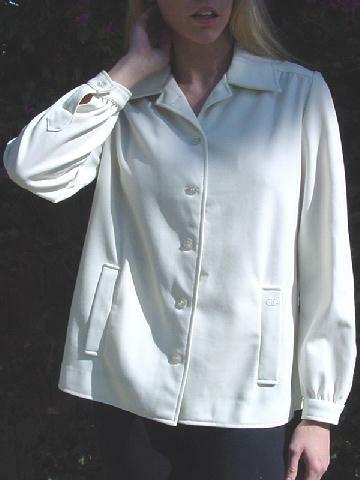 This vintage antique white 100% polyester jacket has long sleeves with 1-button banded cuffs. It was originally purchased at Neiman Marcus. 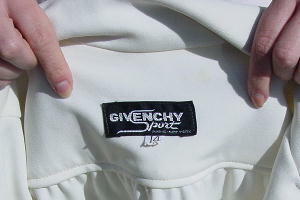 There are 6 pearlized buttons down the front and 2 side pockets still partially sewn shut with an embroidered logo on the left pocket. It has gathering extending downward front and back from the yoke. 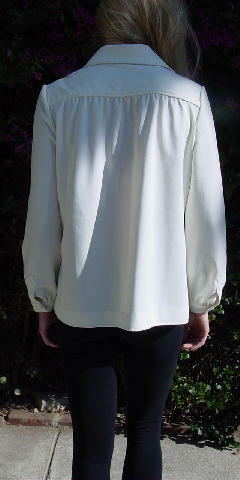 There are two 5 1/8" side seam slits. The tag says it's a size 14, but it fits like a size Medium. shoulder to shoulder 15 3/4"